Fibroblast growth factor (FGF) 19 is an enterokine synthesized and released when bile acids are taken up into the ileum. We show that FGF19 stimulates hepatic protein and glycogen synthesis but does not induce lipogenesis. The effects of FGF19 are independent of the activity of either insulin or the protein kinase Akt and, instead, are mediated through a mitogen-activated protein kinase signaling pathway that activates components of the protein translation machinery and stimulates glycogen synthase activity. Mice lacking FGF15 (the mouse FGF19 ortholog) fail to properly maintain blood concentrations of glucose and normal postprandial amounts of liver glycogen. FGF19 treatment restored the loss of glycogen in diabetic animals lacking insulin. Thus, FGF19 activates a physiologically important, insulin-independent endocrine pathway that regulates hepatic protein and glycogen metabolism. Kir S, Beddow SA, Samuel VT, et al. FGF19 as a postprandial, insulin-independent activator of hepatic protein and glycogen synthesis. Science. 2011;331(6024):1621-4. FGF19 Regulates Cell Proliferation, Glucose and Bile Acid Metabolism via FGFR4-Dependent and Independent Pathways. Fibroblast growth factor 19 (FGF19) is a hormone-like protein that regulates carbohydrate, lipid and bile acid metabolism. At supra-physiological doses, FGF19 also increases hepatocyte proliferation and induces hepatocellular carcinogenesis in mice. Much of FGF19 activity is attributed to the activation of the liver enriched FGF Receptor 4 (FGFR4), although FGF19 can activate other FGFRs in vitro in the presence of the coreceptor ßKlotho (KLB). In this report, we investigate the role of FGFR4 in mediating FGF19 activity by using Fgfr4 deficient mice as well as a variant of FGF19 protein (FGF19v) which is specifically impaired in activating FGFR4. Our results demonstrate that FGFR4 activation mediates the induction of hepatocyte proliferation and the suppression of bile acid biosynthesis by FGF19, but is not essential for FGF19 to improve glucose and lipid metabolism in high fat diet fed mice as well as in leptin-deficient ob/ob mice. Thus, FGF19 acts through multiple receptor pathways to elicit pleiotropic effects in regulating nutrient metabolism and cell proliferation. Wu AL, Coulter S, Liddle C, et al. FGF19 regulates cell proliferation, glucose and bile acid metabolism via FGFR4-dependent and independent pathways. PLoS ONE. 2011;6(3):e17868. Type 2 diabetes mellitus and its complications are, with cardiovascular diseases, leading threats to public health in the 21st century. In the United States, type 2 diabetes care accounts for a third of federal health insurance (Medicare) expenditures—nearly half of it to treat associated macrovascular problems (1). The cornerstone of type 2 diabetes is insulin resistance—a decreased sensitivity of tissues and organs, such as the liver, to the metabolic effects of the hormone insulin (the other major cause is failure of the pancreas to produce insulin). Yet, except for thiazolidinediones—whose checkered safety history, troublesome side effects, and regulatory setbacks stifled widespread adoption by clinicians—treatment options for insulin resistance have generally remained unchanged since the 1940s. Although insulin signaling pathways in cells have been largely deciphered (2), the key mediators of insulin signaling are poor drug targets because they either lack a suitable ligand-binding domain, or are shared with other cellular pathways that regulate cell growth and proliferation. This realization spawned research into “alternative pathways” that control insulin resistance. On page 1621 of this issue, Kir et al. (3) find that human fibroblast growth factor 19 (FGF19) can boost certain effects of insulin on the mammalian liver, raising interest and questions about possible therapies involving this molecule. Kim-muller JY, Accili D. Cell biology. Selective insulin sensitizers. Science. 2011;331(6024):1529-31. Separating mitogenic and metabolic activities of fibroblast growth factor 19 (FGF19). FGF19 and FGF21 are distinctive members of the FGF family that function as endocrine hormones. Their potent effects on normalizing glucose, lipid, and energy homeostasis in disease models have made them an interesting focus of research for combating the growing epidemics of diabetes and obesity. Despite overlapping functions, FGF19 and FGF21 have many discrete effects, the most important being that FGF19 has both metabolic and proliferative effects, whereas FGF21 has only metabolic effects. Here we identify the structural determinants dictating differential receptor interactions that explain and distinguish these two physiological functions. We also have generated FGF19 variants that have lost the ability to induce hepatocyte proliferation but that still are effective in lowering plasma glucose levels and improving insulin sensitivity in mice. Our results add valuable insight into the structure-function relationship of FGF19/FGF21 and identify the structural basis underpinning the distinct proliferative feature of FGF19 compared with FGF21. In addition, these studies provide a road map for engineering FGF19 as a potential therapeutic candidate for treating diabetes and obesity. Wu X, Ge H, Lemon B, et al. Separating mitogenic and metabolic activities of fibroblast growth factor 19 (FGF19). Proc Natl Acad Sci USA. 2010;107(32):14158-63. Fibroblast growth factors (Fgfs) are proteins with diverse functions in development, repair, and metabolism. The human Fgf gene family with 22 members can be classified into three groups, canonical, intracellular, and hormone-like Fgf genes. In contrast to canonical and intracellular Fgfs identified in invertebrates and vertebrates, hormone-like Fgfs, Fgf15/19, Fgf21, and Fgf23, are vertebrate-specific. The ancestral gene of hormone-like Fgfs was generated from the ancestral gene of canonical Fgfs by gene duplication early in vertebrate evolution. 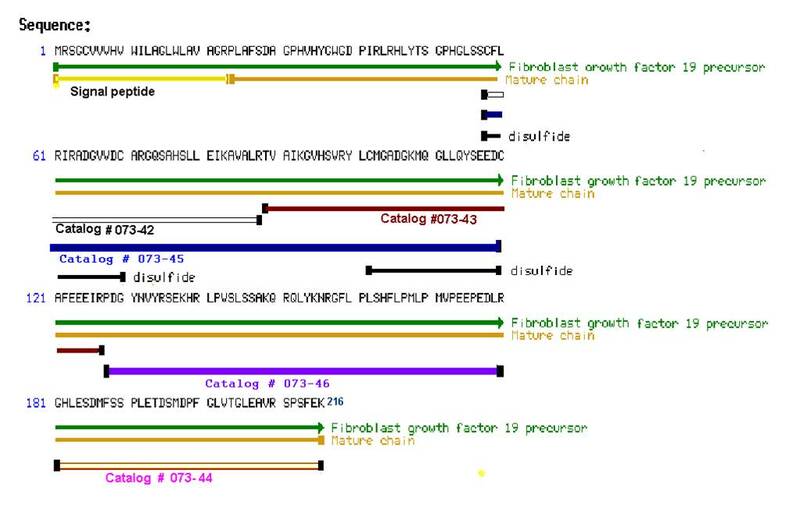 Later, Fgf15/19, Fgf21, and Fgf23 were generated from the ancestral gene by genome duplication events. Canonical Fgfs act as autocrine/paracrine factors in an Fgf receptor (Fgfr)-dependent manner. In contrast, hormone-like Fgfs act as endocrine factors in an Fgfr-dependent manner. Canonical Fgfs have a heparin-binding site necessary for the stable binding of Fgfrs and local signaling. In contrast, hormone-like Fgfs acquired endocrine functions by reducing their heparin-binding affinity during their evolution. Fgf15/19 and Fgf23 require βKlotho and αKlotho as cofactors, respectively. However, Fgf21 might physiologically require neither. Hormone-like Fgfs play roles in metabolism at postnatal stages, although they also play roles in development at embryonic stages. Fgf15/19 regulates bile acid metabolism in the liver. Fgf21 regulates lipid metabolism in the white adipose tissue. Fgf23 regulates serum phosphate and active vitamin D levels. Fgf23 signaling disorders caused by hereditary diseases or tumors result in metabolic disorders. In addition, serum Fgf19 or Fgf21 levels are significantly increased by metabolic disorders. Hormone-like Fgfs are newly emerging and quite unique in their evolution and function.